Dead sea salt coarse grain (2 - 4 mm), & fine grain (0 - 2 mm), unrefined direct from Israel. Harvested directly from the Dead Sea. 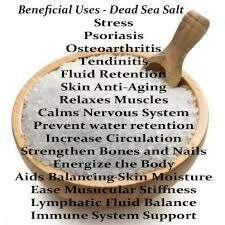 Dead Sea salt is an excellent choice for spa treatments, therapeutic grade bath salts and scrubs. 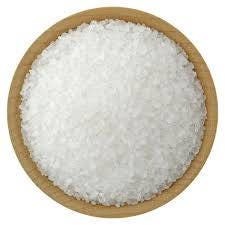 We offer Dead Sea Salt for sale to use in bath soaks and bath products. We do not claim to be able to diagnose, prevent or cure any disease. Below is some information about Dead Sea Salt - There are hundreds of studies and articles about its uses and benefits. From Wikipedia, the free encyclopedia! Dead Sea salt refers to salt extracted or taken from the Dead Sea. The Dead Sea is popular with tourists from all over the world for its reputed therapeutic effects. 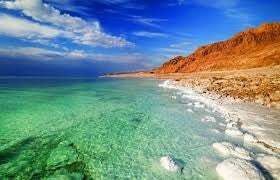 The water of the Dead Sea has a salt content of 29%, compared to 4% in the oceans, and is consequently substantially denser. This allows anyone to easily float on Dead Sea water because of its greater density. 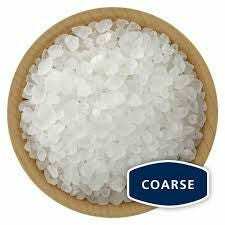 Its mineral composition is also different from ocean water since only 12–18% of Dead Sea salt is sodium chloride. By comparison, 85% of the salt in normal ocean water is sodium chloride. Various cultures and groups of people have visited the Dead Sea for therapy, dating back to the time of the ancient Egyptians, utilizing the salt in various unguents and skin creams, as well as soaps, just as it is used today. Rheumatologic Conditions – Dead Sea salts can be effective in balneotherapy of rheumatoid arthritis, psoriatic arthritis, and osteoarthritis. The minerals are absorbed while soaking, stimulating blood circulation. Skin aging – Further research into Dead Sea salt benefits has shown a 40% reduction in the depth of wrinkling. The photos that we have above are stock photos. Your Dead Sea salt will be packaged in a bag. We use calculated shipping which estimates the cost by size of package - weight of package - destination of package. Our 1 -3 - 5 pound sizes can be combined with other items and therefore can be shipped using calculated shipping. Our 10 & 20 pound sizes will be shipped in packages that cannot be combined with other items and shipping will be offered at a flat rate. As with all of our products you can pick them up from our shop at no charge.